Charity runner Tony ‘The Fridge’ Phoenix-Morrison from Hebburn began distance running by doing the Great North Run 25 years ago. He has gone on to complete the famous race 16 times and last year decided to increase the challenge by running with a 40kg fridge on his back. This year, he has notched the challenge up considerably more and is running the half marathon route with his fridge every day, for 30 days, culminating with the Great North Run itself. 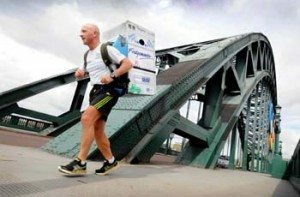 Tony, who has also completed the Marathon of the North, Blaydon Race and a 14 mile leg of The Real Relay carrying his fridge, is determined to complete this incredible physical and mental challenge and is raising money for the Sir Bobby Robson Foundation. Tony says: “All my previous challenges have taught me that running with a fridge is going to cause injuries. From day one, the difference between completing or not completing this challenge will be how I manage the injuries I sustain. “I’ve also learned that no amount of training can prepare you for friction injuries caused by the constant rubbing of a six stone metal box on your back and how that tears off your skin. “The most frightening part of this challenge is the thought of friction burns, which after just one run can leave you in pain for weeks. “I’m not afraid to admit that this challenge has me scared, but I believe passionately in the charity so I will just have to cope with it. Tony began his latest challenge on Saturday (18th August) and will be following the route of the Great North Run as closely as possible. He sets off at 6am each day and is encouraging anyone who would like to join him for some, or all, of the route to get in touch. He adds: “Support is so important to me successfully completing all 30 runs. It’s great to hear cars beeping and see people waving and shouting encouragement. I’ve already had one man who spotted me out running, drove home, changed and then came back out to run with me to South Shields. Follow Tony’s progress every day on Twitter via @tony_the_fridge. 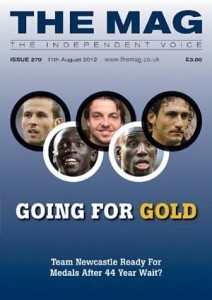 To support Tony and donate to the Sir Bobby Robson Foundation, or for more information, please visit www.therunproject.co.uk.